One-box cars and minivans, especially the shorter ones, tend to be called “bread loaf” in several languages – including Mandarin, Russian, Burmese and doubtless plenty of others. It’s a pretty accurate description of the overall shape. 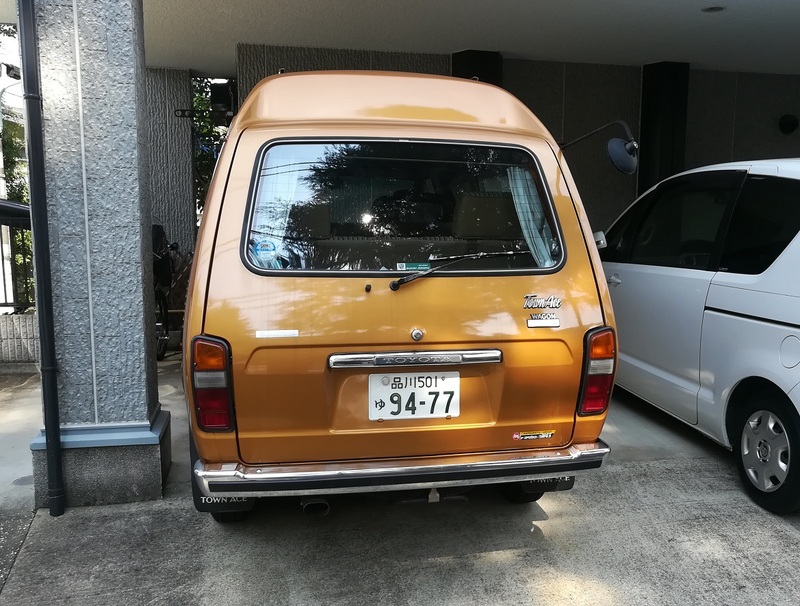 This Toyota TownAce, however, pushes the verisimilitude up another notch by wearing a high roof and golden brown paint job that really makes it very loaf-like, in a nicely baked sort of way. Let’s have a slice while no one’s looking. You have to hand it to Toyota: they may not have invented the minivan, but once they espoused the concept, they really ran with it. Most other carmakers had just one passenger van on offer in the ‘70s. Some engine options, maybe even an extended wheelbase, could be proposed, but that was usually it. One well-appointed van would suffice, lest they cannibalize station wagon sales. Toyota, on the other hand, took that segment, cut it up into sushi-grade pieces and served it bento-style: they had a complete range by the mid-‘70s. 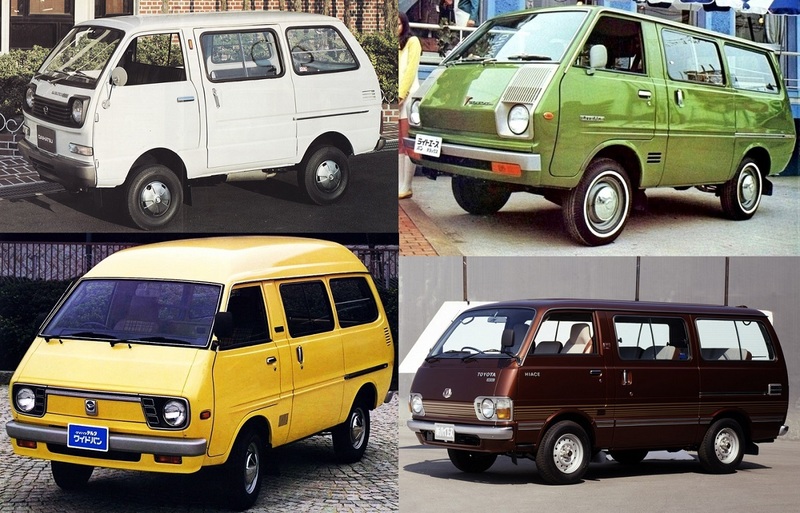 You’re so van – Toyoboxes circa 1979, clockwise from top left: Hijet, LiteAce, HiAce, Delta Wide. In the ‘60s, Toyota had two vans – the HiAce and the MiniAce. The MiniAce was boxing in the kei car category, the HiAce in the circa 1.5 litre “big car” (for Japan) category. But then Toyota went and bought Daihatsu in 1967, who were the kings of kei with their Hijet, so the unnecessary MiniAce eventually disappeared. In 1971 the Toyota LiteAce / Daihatsu Delta were launched with a choice of 1.2 or 1.4 litre 4-cyl. engines for folks who didn’t fancy noisy 2-cyl. kei vans such as the Hijet or MiniAce. This left a gap between the LiteAce and the HiAce, which was inching towards the 2-litre category. Toyota filled the niche in 1976 with the TownAce (and its Daihatsu Delta Wide clone), essentially a stretched and widened LiteAce platform with a choice of 1.1 to 1.8 litre engines. 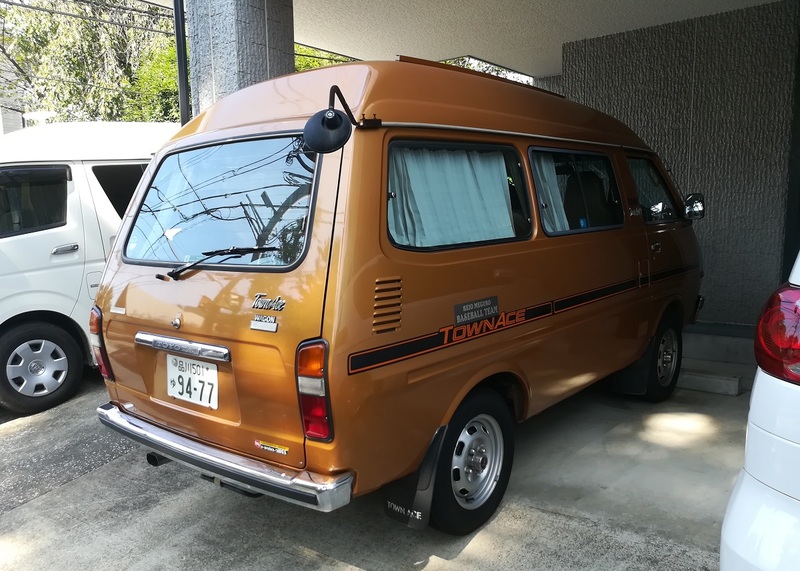 So by the late ‘70s, Toyota/Daihatsu were fielding four sizes of vans, including two (LiteAce and TownAce) that were available under both marques. All these were simple and rugged RWD vehicles with leaf-sprung live rear axles and bulletproof 4-cyl. engines – except the Daihatsu Hijet, which still had a twin. 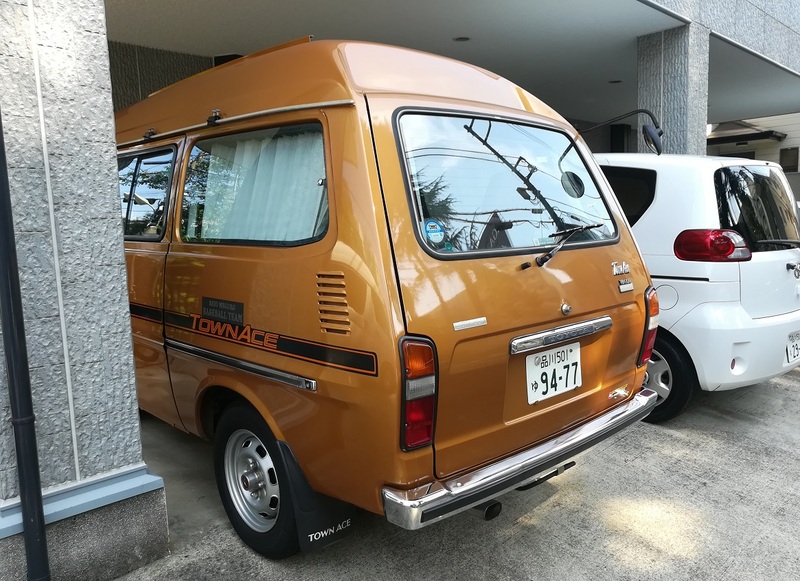 With the exception of the TownAce, which was more of a people-carrier, Toyota/Daihatsu proposed purely utilitarian and/or pick-up versions of their vans as well, but Toyota knew there was a huge market for passenger versions of these vans. The trick was that the markets were mainly in Asia and Africa, as opposed to Europe and North America. This is partly how Toyota became the number one global brand: they catered to markets that were largely untapped by European and American makers. Their only real non-Japanese competitor was the VW Transporter, which had its limitations and was getting on in years. The TownAce and its kin were the new vans in town, though they were ancient underneath – which was actually a real plus for these markets. It didn’t hurt that vans like the TownAce were also selling quite well in Japan itself. The TownAce’s high roof, which came in two sizes (and a sunroof on range-toppers such as our CC), became available from late 1978 and proved quite a popular option. It is unfortunate that this became such a trend, though – particularly in Japan. 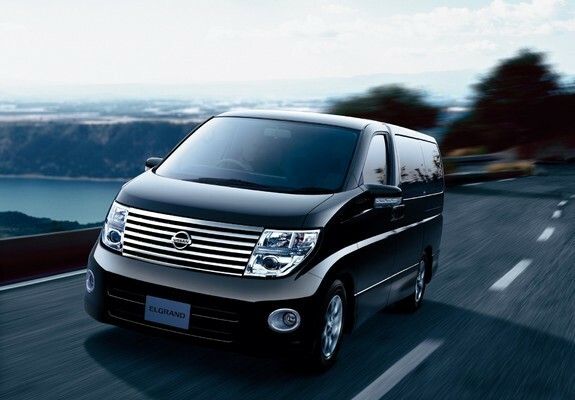 It seems nearly all JDM models, from kei cars up to family saloons, have a boxy minivan version these days, with their driver’s head poking out of the lower third of these cars’ massive windows. They look positively horrible, like an aquarium with wheels. Back when these were nearly all RWD cab-over-engine affairs, the seats were higher and the high roof could be justified. Our CC is a top-of-the-line “Super Extra” wagon, which replaced the previous “Custom Extra” trim level when the TownAce was given a mild makeover in the fall of 1979. The chromed fenders on our 1st generation mark two TownAce are a distinctly Japanese trait, still very common on big trucks and current minivans. Some trucks push it too far and have a blinding virtually all-chromed front end, but when it’s only a couple of panels, it’s not unattractive. The front of the car was given a more extensive facelift with rather ugly square headlamps for the 1981 model year, which makes this 1980 version all the more desirable, in my opinion. 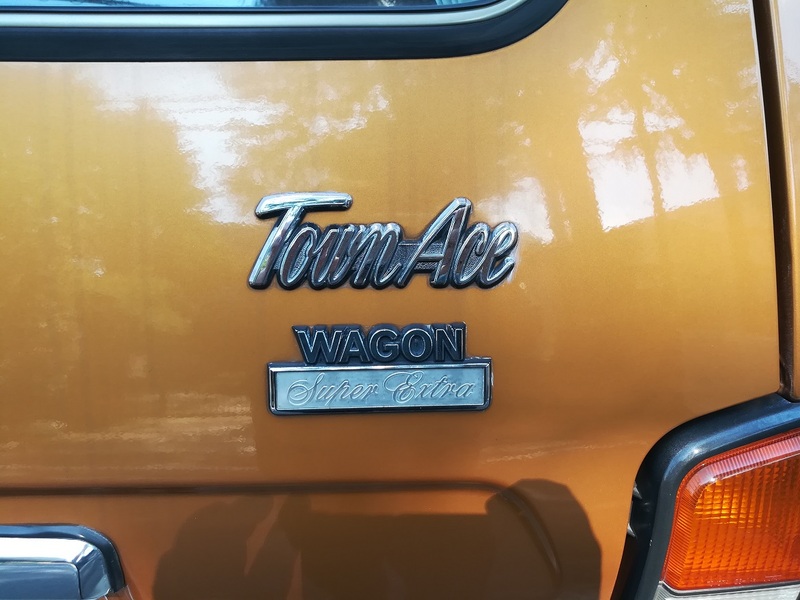 The next generation TownAce debuted in the fall of 1982, ushering in 4WD and coil springs all around – as well as being introduced to North American and European markets for the first time, with quite a bit of success. The interior is as roomy as you’d expect. Surely many of you will recognize the trademark “three horn” Toyota steering wheel, also seen on contemporary Corollas. I’m not sure whether these were available with automatic transmission. 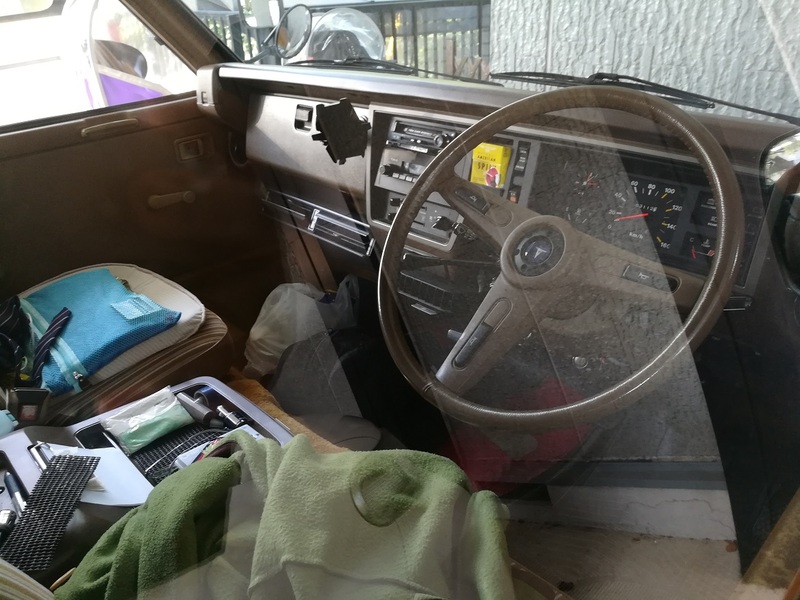 This one has a manual “four on the tree” shift – still pretty common in Japanese cars of that era, but already very rare in Europe by then. I also like the “cane handle” parking brake on this van – looks very similar to something one would find on European cars of the ‘50s. But the seat design and especially the fabric they are covered with are there to remind us that we are definitely in a car designed in the ‘70s. The 95 hp 1770cc engine (also found in contemporary Corollas, MkIIs, Celicas and Crestas) associated with the Super Extra package gets the middle seat. What most impressed me when I saw this thing was how pristine it was. Not a mark on it, all badges, panels, paint and interior trim in perfect nick – the very definition of a mint condition vehicle. It looks like it rolled off the assembly line a few weeks ago. I don’t know whether someone spent a great deal of money painstakingly restoring it or whether it was just loved and cared for by a careful (and lucky) owner all this time. Personally, this is not the sort of vehicle I’d think of preserving for future generations, but I’m sure glad somebody did. Every day lately it seems that I am introduced to some new and unfamiliar vehicle. You have done so again. This one makes me wonder if it could have given the VW a run for its money in the small van segment that the US makers had abandoned by the early 70s. Perhaps with a little bump in power this could have been a contender here. 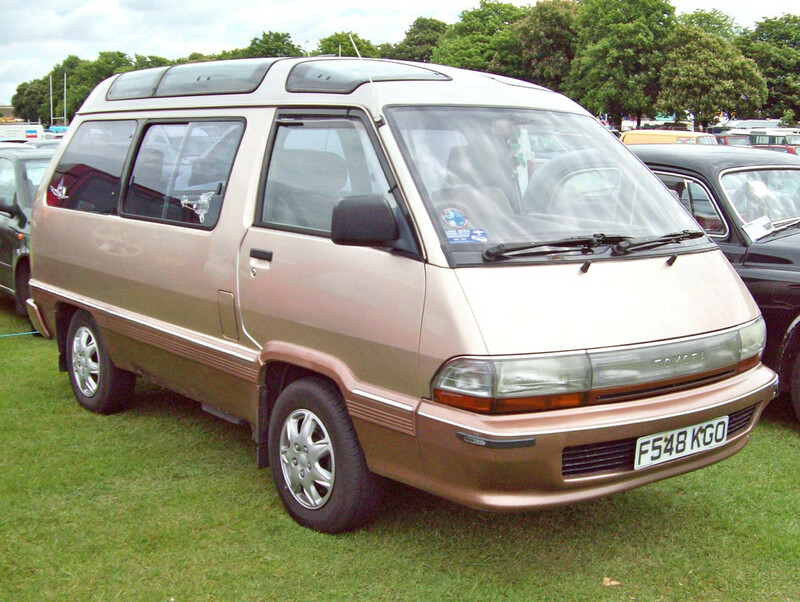 It did just that, starting in 1984, with a revised front end for better safety, in the form of the Toyota Van. And they did become a rather successful alternative to the VW Vanagon, which was getting expensive. In Eugene, the Toyota Van long ago replaced the VW bus for cheap van use; the VWs are now mainly Westfalias or collectible. Although they’re extremely rugged and long lived, Toyota Vans are finally becoming somewhat less common on the streets here. Your analysis, Tatra87, is startlingly right. Toyota saw a rest-of-world that Western makers didn’t. A rest-of-world with little or no regulation, where tinfoil crash quality vehicles could be foisted upon “them” as people movers for decades. (Google VW T 3 crash test, IIRC, where a LiteAce crash test is shown). Lots of unnecessary blood on that World No. 1 badge, I reckon. Maybe I’m just in a bad mood. Outside my window as I type this is a survivor ’82 or so LiteAce, which I’m not about to photograph as it’s driven by a young guy who sometimes deals in, and clearly uses, something bad for him. I actually happened to see the crash-test video not long ago, and it depressed me that this kid (I speak to him when he’s ok) is very likely to die if he even lightly crashes his crate when high one day. Or perhaps more relevantly, even when he’s not. Anyway, he’s in an affluent country with medicine that might save him. But in Thailand or Nigeria? A small investment of Toyota mega profits could’ve made an easy 100% improvement in safety of these things as time went by. Have to agree the Town Ace example you show here is quite spectacular though. For the time, these probably weren’t any worse (or that much worse) than vans from other countries. You’re right though, the Japanese did keep making these van-based people carriers for a long time and a lot of them had horrible crash test ratings, as I mentioned in my piece on the Toyota Spacia and Mitsubishi Starwagon. A lot of old TownAces were imported here secondhand but lately a lot of the grey imports I’ve been seeing are much newer Nissan Elgrands. According to JNCAP – Japan’s crash testing agency – the latest generation is quite safe. Pictured is the previous generation, which is getting very common here in Brisbane. Not sure how well they fare in crash tests. The Japanese have long been making plush people carrier versions of vans, but it’s only some of the more recent ones that interest me. Hey man, don’t knock Thai medicine. They can heal you long time. You think that Toyota were the only ones making death traps in 1980? May I refer the honourable gentleman to the following 1980 model year offerings: Trabant, 2CV, Fiat 126, Mini, Syrena, Pinto, etc.? Fancy your chances in one of these? The biggest 1980 pick-up truck is no match to the smallest non-Chinese 2017 road car, safety-wise. And Toyota were selling these vans in Japan and Australia by the thousands. It’s not about lack of any particular country’s market regulations, it’s about making a product folks in many places will want to buy. And it’s about conquering markets where competition is more of a level playing field. I suppose my point was more that they kept selling 1980 safety tech many moons after it’s expiry. As William pointed out, the 1986 L300 was sold here until 2013, when regs finally removed it. At least it was just a van – the multiseat Starwagon is probably still being sold somewhere for all I know, and that’s the problem; it’s not here, it’s somewhere there, where poverty makes it the choice. And bugger-all expenditure from a big corp on a modicum of safety stuff would mean less blood. But you’re quite right Toyota isn’t alone, just the most visible. Anyone for a crash test in a 2012 VW T3 in Brazil? Thai medicine. Not in a bad mood now. Sure, there were plenty of alternatives to VW back then, but usually just one per automaker – except for Fiat, who had both a small rear-engined and a bigger RWD (then switching to FWD) van in their lineup since the ’50s. 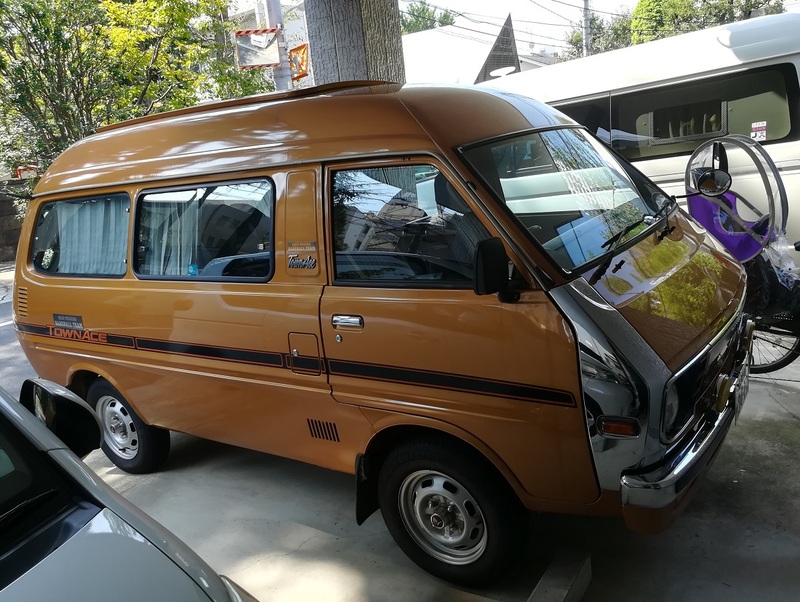 My point was that Toyota fielded a complete passenger van range, four models from the kei class to 2 litres, in the mid-’70s. Nobody else did that back then. I think we had our Brown car discussion a few days early. I think this is the ultimate brown vehicle! I’ve never noticed the chrome fender treatment on Japanese cars or trucks before. When I saw this picture at first, I assumed the chrome treatment was a more recent embellishment. I guess not. Given the pristine exterior (the tape graphics look original, the wheels are unscuffed, etc.) I was surprised to see the interior shows signs of regular use. It doesn’t look like this van just sits in its parking space all day… after all, there’s a Pringles can in there! Yet still, the interior carpet is in better shape then the carpet in my living room. Those townaces used to be fairly common here in NZ back in the day, but I don’t recall seeing the chrome “fenders” before. They’re quite common as option parts on Japanese light trucks. Never seen them on cars through. Killer find T87. That is immaculate. There’s an orange base van driving around Melbs with a similar modicum of ownership pride, but not a Super Extra. I’ve caught the contemporaneous Hiace premium version which was a grey import here, can’t remember its trim name. Never seen that chrome corner treatment before. Theres a deluxe lounge van but that could be a Nissan, friends have a Super Custom Hiace complete with dual AC and power curtains rusting quietly on their lawn it has the 3.0 turbo diesel engine and auto trans. 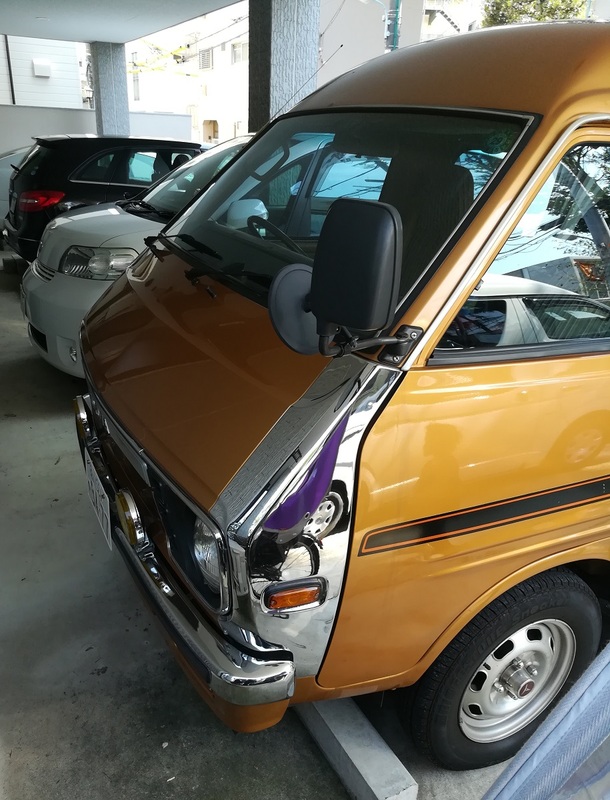 I know Japan had an affinity for mirrors in unusual places, but this is one I can’t remember seeing before: A convex mirror looking over the van’s hood. 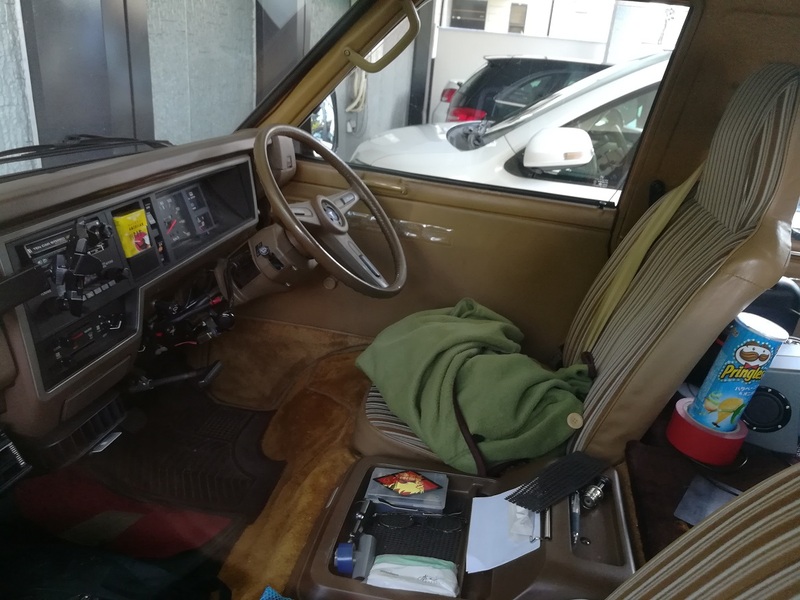 What’s ironic here is that with a short hood (that probably extends no more than 18″ from the dashboard), big windshield, and high seating position, the TownAce probably has the best forward visibility one could ever hope for. When I think of convex hood mirrors, I think of long-hooded North American tractor trailers… not Toyota vans. I can see the rationale for the matching convex mirror on the rear, but this front mirror really perplexes me. It’s for parking; it allows you to see how to get literally as close as possible without touching (So not Paris style, lol). Yep, I used to have to park in some astonishing places in my kei-van (way smaller and less safe than this one), and those mirrors let you put your car a half-inch from a wall if need be. I have a question and it may make me sound unintelligent but if I don’t ask I won’t know. I’m assuming this van is in Japan and has been there it’s whole life. Why are the badges in English and not in Japanese? I’ve noticed this on several cars from several countries. A lot of times it looks like the manufacturer stickers under the hood and in the door jambs will be written in Japanese but the badging is in English. Because English is the most universal global language, and the Japanese have always been very export oriented and image conscious. How can you project any image with your vehicles if no one but the locals can understand what it means? Futhermore, at least with the Japanese I’ve worked with, English has a certain cachet. If you’re of a certain age (ok, my age, in the 90s) you remember dudes getting kanji tattoos and have no idea what they actually mean? The opposite effect is us seeing things like “all wheel drive system for good driving in varying places” and the like. English just “looks cool” to them like random Chinese and Japanese characters “look cool” to some Westerners. Wagonlove read up on Rogers exJDM car post we have thousands of ex JDM cars van utes and trucks here only the badges are in English the satnav is in Japanese as is the stereo and the dont work here the rest of the car is in Japanese including all the information for aquiring parts, I had a exJDM mitsubishi Mirage VIE X every concievable option was in it I ended up putting a NZ market carby and ignition on it to get around some problems it had, ride comfort was amazing for a small car, handling was not so great. If your sat nav is by Gathers, it may be capable of displaying in English…mine is. Check Youtube for how. Thanks guys. I knew I could count on the CC to enlighten me! Great find – had one like this in mid-90’s in Japan – cost me $800. This orange color was popular – mine was silver. Sold it and bought a newer Town Ace – much nicer – had the fuel injected 1.8 engine. I only ever saw the more utilitarian ‘work’ versions of these early ’80s Town Ace (or Lite Ace, as they were known here); I didn’t know they had the fancier versions back then (the equivalent of today’s Noah and Voxy models). Its main rival here was the equally utilitarian Datsun C20/Nissan Vanette.